Somewhere in a large coastal city, there was an enormous beach where the turtles went to raise their newborn young. That was where Juliet was born, and she is the main turtle in our story. When Juliet was a baby turtle, she was protected all day long by her mother so that nothing would happen to her. But as she grew older, she began to realise that she was a born explorer and she enjoyed going off on her own to explore new beaches. 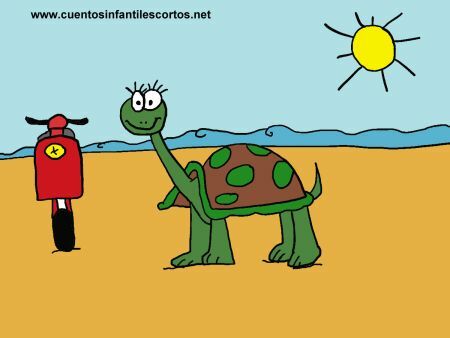 When Juliet was old enough, she decided that to explore the world she would have to get a vehicle in which to travel, for turtles were very, very, very slow. Juliet was unhappy about this, so she decided to look for a moped that had been abandoned and that way her mother would never know. Finally, Juliet found what she was looking for – an old scooter abandoned near the beach. Without a second thought, she took it and went off to find another beach along the coast road. As she rode, she noticed that the moped was going very fast, and that it was getting more and more difficult to control with every passing moment. Suddenly, a mosquito flew into Juliet’s face, which made her crash onto the tarmac so heavily that she broke a leg. With great difficulty, Juliet crawled back to the beach to see her mother, who had been very worried at her long absence.